Matching band available to make a beautiful classic style wedding set. Sizing charge 2-4-1 When you buy the set! 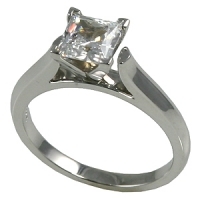 Beautiful Knife Edge style gives this beautiful engagement ring a sharp and elegant look. to match this lovely wedding set. The matching band is available and also features the knife edge for a perfect wedding set. Approx gold weight in size 6: 3.49 grams *Truely worth it's weight in GOLD!